Massive rings with oversized gemstones of historic vintage are far from common. Some examples exist from antiquity, and there are a limited number of substantial papal and bishops' rings from the Middle Ages. Rarer still are historic rings with large aquamarines, especially those set alongside pearls. This hoop with triangular section is flat on the interior and widens towards the bezel. There it forms a base for the oval and conical bezel with a cabochon of aquamarine (or perhaps pit glass?). Attached on four sides of the bezel are calyx-like settings in gold, each with a drilled pearl held by a gold wire and decoratively framed with beaded wire. S-scrolls made of flat strips of gold flank each calyx. Massive rings with oversized gemstones of historic vintage are far from common. Some examples exist from antiquity, and there are a limited number of substantial papal and bishops' rings from the Middle Ages. 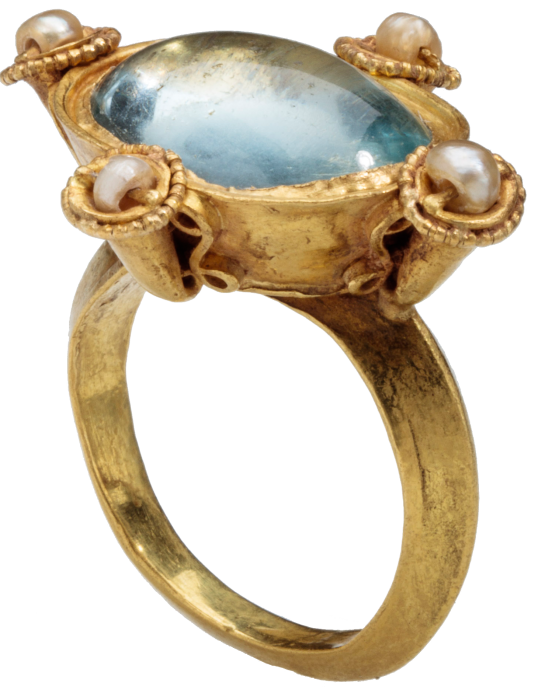 Rarer still are historic rings with large aquamarines, especially those set alongside pearls. Massive rings with oversized gemstones of historic vintage are far from common. Some examples exist from antiquity, and there are a limited number of substantial papal and bishops’ rings from the Middle Ages. 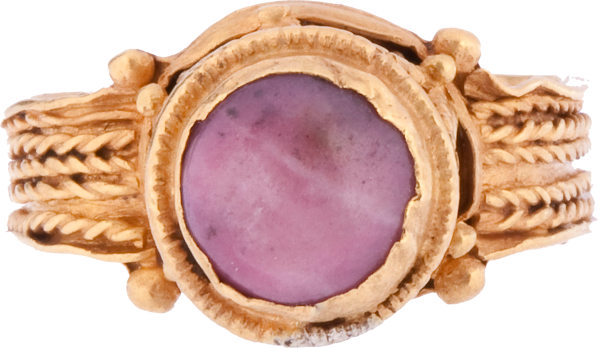 An individual of considerable status at the imperial court probably wore this stunning ring with its large stone. Jewelry of similar design and color to the present ring adorn Justinian, Theodora, and their attendants in paired mosaics of San Vitale at Ravenna. The Byzantine goldsmith responsible for the present ring may well have reused a highly prized gemstone of Roman origin, to which he added four pearls imported from the region of the Gulf, the Red Sea, or southern India.